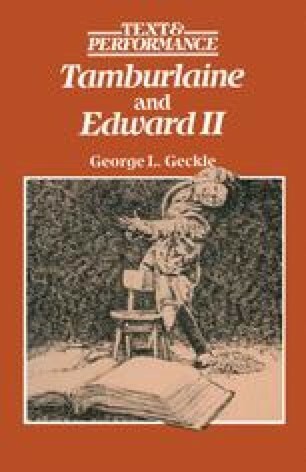 We know relatively little about the history of Tamburlaine prior to the twentieth century. It is generally accepted that Part I was written in 1587 and Part II no later than 1588. In The Elizabethan Stage, E. K. Chambers cites a letter of 16 November 1587 which mentions an accident at a performance by the Lord Admiral’s Men in which a player, who was supposed to shoot a gun at a fellow actor tied to a post, ‘swerved his peece being charged with bullett missed the fellowe he aymed at and killed a chyld, and a woman great with chyld forthwith, and hurt an other man in the head very soore’ (Oxford, 1923, II, p. 135). It seems likely that the play in question was Part II of Tamburlaine and that the accident occurred during the execution of the Governor of Babylon. If so, Marlowe had completed both parts of Tamburlaine by the time he left Cambridge in 1587. Certainly Part II was completed by 1588 because Robert Greene refers in a prefatory epistle to his Perimedes the Blacke-Smith (published 1588) to ‘daring God out of heaven with that Atheist Tamburlan’, undoubtedly an allusion to Tamburlaine’s burning of the Koran and then challenging Mahomet to punish him for it.